A client asked me a good question: How can I entertain my blog readers? When your writing is helpful to your readers and when you avoid rambling, isn’t that enough? In hindsight, I’m not sure I was right. In this age of information overload, shouldn’t we aim a little higher than helpfulness? I’ve written before about writing like a human so we can engage and connect with your readers. But should we also try to make our readers smile? A couple of weeks ago, I read the Pulitzer-winning novel Less by Andrew Sean Greer, and I was struck by the fun metaphors. Now here is a technique, I thought, we can all use to add a dash of wit to any type of writing, even serious business writing. Not all metaphors need to be funny. If your aim is to explain a concept, you can simply paint a vivid picture. a blank space waiting to be filled. And then a Torchbearer envisions a new possibility. Some say being a torchbearer is a burden. Some say it’s a blessing. are the ones who change the world. The torchbearer metaphor is not surprising, but the aim of Duarte and Sanchez is to educate, so the metaphor is fine—it makes the abstract concept of leadership concrete. Had you ever thought of comparing kissing to speaking a foreign language? The comparison comes as a surprise, and at first the metaphor may even seem a little crazy. Its this weirdness of comparing widely differing ideas that makes a metaphor funny. By his forties, all he has managed to grow is a gentle sense of himself, akin to the transparent carapace of a soft-shelled crab. Wit is a form of creativity—it’s discovering a surprising similarity between unrelated things. And to make the unusual similarity clear to your readers, you add details demonstrating the likeness. Metaphors don’t always pop into your mind easily. Sometimes, you go out for a walk and, at once a metaphor pops into your mind. Woohoo! At other times, you rack your brain, and no matter how long you search, no metaphors are to be found. When metaphors are elusive, personification can come to your rescue. Personification is a kind of metaphor where you compare an abstract concept to a human. It’s like breathing life into something lifeless. The sentence just limps and wheezes along to its sad end with a tuneless clank. It doesn’t help the next one up or the previous one down. The more life you breathe into the abstract concept, the more interesting the personification becomes. To be witty and entertaining, you don’t need to turn yourself into a stand-up comedian. You don’t even need to tell laugh-out-loud jokes. In fact, as a blogger, you’re better off adding a modest dash of fun to your writing than aiming for laugh-out-loud jokes. As Doug Kessler suggests, “laugh-out-loud-funny is a low-percentage game.” It’s easy to go wrong, and leave your readers feeling baffled. So, let’s entertain our readers with a dash of wit and a splash of personality instead. PS Thank you to Anne for inspiring this post. Absolutely! A truth as solid as Stonehenge. Well Henneke, if truth be told, in line with current day teenage thinking, the 1990’s IS Ancient. ( I mean it’s at least pre Facebook! ) Stone circles are quite simply cool with a capital “K” . I recently re-discovered a stone circle just 15 minutes drive from my house which was definitely built by a shed load of farmers around 5000 years ago. I suppose that must be categorized as pre-Ancient come to think of it and they didn’t even have Youtube to learn how to do it. Really Great article..thank you for insightful writing as always! Excellent post 🙂 Very timely. I’ve thought a lot about metaphors lately, because my husband is reading his favorite author, Frédéric Dard, under his pen name San-Antonio. Frédéric Dard seemed to be able to come up with hilarious metaphors without any effort. Like when he talked about his colleague and said he was “melting like butter on a stove” or when the same colleague got his private parts stuck in his zipper, asks for oil and then returns from the kitchen with a spot the size of a washing machine door. I immediately went to check out San-Antonio’s books because this sounds like the books I’d love to read. Such a pity … I can only find the books in French and I’m not sure my French is good enough! Maybe worth a try? I can practice my French and metaphors at the same time? I don’t have much natural humor so maybe this will help me. Great post. Ha! A phenomenal post! This one is a keeper! And what a creative idea to put Henrietta with the Road Runner! Very cute! ❤️? Interestingly, these tips were the basic English language building blocks that were taught to us in our high school days. Seeing how instrumental they could become in writing, from a different perspective like this is very illuminating! A wonderful article as always Henneke. What would we do without metaphors? I think they add colour to writing and make things easier to see from the writer’s point of view….give you a glimpse of personality, they help you decide whether you like the style of writing or not…make it easier for readers to engage…it’s a bit like how I really like your illustrations : )…they are uniquely you and a big part of why I’ll continue following your writing. Oh yes I use these here and there Henneke. Usually injected with some humor and many times aligned with colorful experiences I collected while circling the globe for the past 8 years. 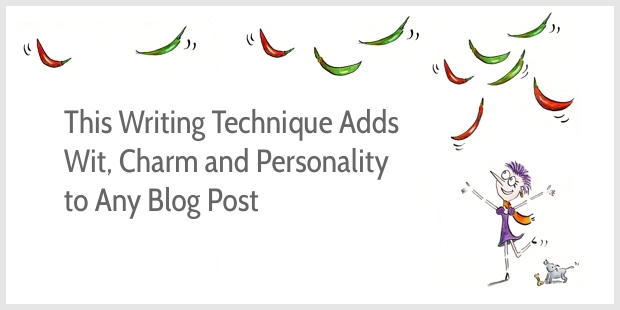 Skilled writers pepper colorful metaphors into their works freely, boosting their reader fun factor. That sounds great! What I like about using metaphors, is that even if you don’t have colorful experiences to share, you can still add a dash of fun to your writing. I so love this one, because it is so vulnerable, what the author is describing, so revealing about the character Less. In an age of armor, he never grew any, even at fifty. I will read the novel. Well done. Also, for the Stonehenge inspired, I am trying to create a replica of Stonehenge here in the US for education and inspiration. Thanks for sharing about the Scottish one. I read it in the last week of 2018, and it would be on my list best books I’ve read in 2018. It’s written with sensitivity and humor. I hope you’ll enjoy it, too! Bless you, Henneke, for this fantastic post! I’ve been struggling with my own writing for some time. I’m a decent writer, but I’m interested in making my work livelier and more endearing. This “fun metaphor” concept sounds like the perfect blast of icy cold water my writing needs. I’m not sure if I can manage it, but I’ll certainly give it a try! As always, thanks for the wonderful tip. I’m sure your writing is not as icy cold as you might think. When I started using metaphors a few years ago, it felt quite weird and I was nervous about publishing my post, but I’m happy summoned the courage courage to try. Have fun! If you really, really, like metaphors and want to read more about just how pervasive they are, check out Metaphors we live by (Lakoff and Johnson). I’ve come across it a few times, but never started it. With your recommendation, I bump it higher up my reading list. Thank you. I never “wrecked” my brain to come up with a metaphor. However I have often wracked my brain. Differences between British English and American English, Henneke. They’re a long way further apart than just the colour/color/favour/favor thing it seems. For example, in Australia where I’m from we say the “kerb” (footpath). In the US, they call it the “curb”. In British English, “rack your brains” seems to be the preferred option, too. It may be different in Australia? I try to stick to American spelling on my website but I don’t always get it right. It’s not easy as a non-native English speaker to understand all the differences. I get sometimes mixed up. 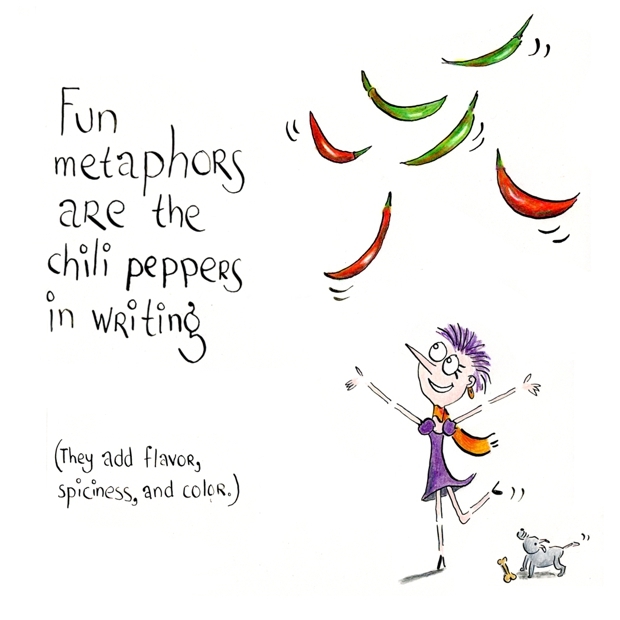 The chili peppers of writing, eh? I love me some spicy food! I liked the advice at the end about why you shouldn’t always try to go for a big belly laugh. I like standup comedy, which is the spicy chili of writing, but if I ate it all day every day, I would be sick of it. Sometimes a little pepper does the trick. Thank you for stopping by, Dave. I appreciate it. Really enjoyed this article lol it actually made me laugh in part. I’ve been blogging for a little while now and i’m constantly telling myself “just act like i’m talking to a friend”. I find it difficult to get the balance between serious and funny at times, probably just over thinking it! I also find it helpful to think about whom I’m writing to so I can find the right tone that suits both me and my readers. If you find the balance hard to find, how about aiming for lightheartedness? This is a great suggestion. Thank you! Politicians are all like breakfast cereals. They’re packaged for mass consumption, there’s more air than substance and they go stale real fast. Yes, so true. You can find connections between everything. I find it can feel harder to come up with the right metaphor, when you’ve decided on your message first (as usually happens in business writing) and then look for a metaphor to package it. The copy is bland and flat. What I need is six or so metaphors to perk it up the copy so that potential customers will read it. How do I go about finding the inspiration? There is no copy on my site just now. Thanks for the reminder, Henneke. Once we use a metaphor in our writing, readers become more engaged to read on. A great way to keep them hooked. Yes, so true. The metaphor is a good way to engage readers. Thanks, Bill! I was enchanted today. Those writers and their metaphors did more than a ton of how to books. To write with so much feeling is a superb high and a zone that’s incredibly exciting. My mind is racing as I write, the thoughts flowing from a pent up dam. Thank you Henneke, you don’t teach. You enlighten. Beautiful read. Thank you. Thank you for your beautiful compliment, Nicolas. I was really inspired by the metaphors in the book Less. When I discover good examples, the writing flows naturally! My Chinese students will love these metaphor writing tips and ideas, Henneke. They are the cat’s pajamas! 🙂 As a fellow writer and English teacher myself, I thank you. (p.s. Culturally speaking, metaphors take on a whole new concept since many non-native speakers can’t directly reference their colloquial meanings or references, i.e. “the cat’s pajamas”. Another demonstrative and entertaining article. It’s like the best (and last) layer of tasty topping to your sandwich! Thank you for your lovely compliment, Shelly! Love the sentence metaphor Henneke. Maybe that’s why I can’t stop the urge to rewrite what I have already revised five times. It’s like bringing an actor back on the stage to revise what they said in their last appearance. Paul – Not sunny but hot Sydney. We’ve had snow here for a few days—quite unusual for this part of Britain. Again, a wonderful post Henneke. The chilli peppers metaphor has a deep meaning to it. They surely add spice to the writing but if one overuses them, the writing becomes indigestible. Yep, that’s true. If you use too many metaphors, then different imagery starts competing in your reader’s mind, and that undermines the impact of the metaphors. Great tips. You can rarely go wrong using metaphors. Using images even exaggerated ones is one of the methods recommended to create impact and make the information memorable. Metaphors give life to even abstract words. They give the reader the much-needed visual instead of her trying to come up with her own representation. So less energy spent by the brain there. Adding a fun metaphor to the content is a great concept. Metaphors reminded me of Ryan Biddulph’s blog, and then I thought, wait, he might have left a comment here, and I scrolled down the page, and there you go, found his comment. I love his passion for writing and connecting the dots. I’m thrilled to learn the art of using fun metaphors to the business writing. We’ve seen that writing a business copy means sticking to the basics, but this blog post seems to be making a difference. 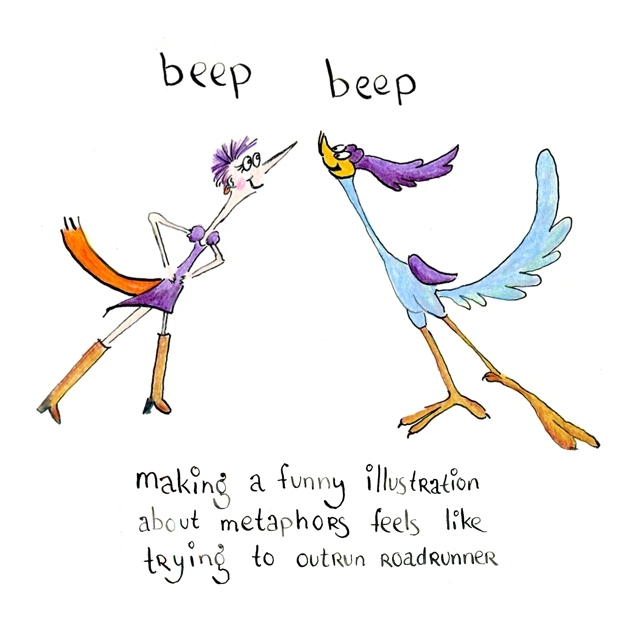 Quite a few of us are fans of metaphors 🙂 They’re less common for sales copy, but they’re great to use for business blog posts or non-fiction books. As always what you say in your posts is relevant, interesting and helpful, Henneke. I, too, think metaphors are so very inspiring in both writing and speaking. You’ve given us an idea or two on getting them. When exiled Cuban poet Pablo Neruda (Philippe Noiret) arrives on a tiny Italian isle, there’s so much new mail that Mario (Massimo Troisi), an unemployed, uneducated layabout, is hired as a postman. His job is simply to deliver Neruda’s daily mail. Mario soon becomes a student of the poet, learning the art of poetry to woo a local barmaid (Maria Grazia Cucinotta) and tell about the struggles of the working-class villagers. A firm friendship develops, and the postman turns into a changed man. I must say that’s the great topic. Love the use of metaphors that too with so much fun. Thank you, Shweta. Happy writing! Awesome post. I am always looking at ways to make my writing witty. The tips are great and they will help me achieve that.